I have a secret to tell. Do you know that between Cheeseboy and I, he is the bigger fan of the original Beauty and the Beast? He don’t just memorize the songs from the animated movie, he also remembers almost all the lines from the movie verbatim! And of course the Beauty and the Beast tunes are among his favourites for piano playing. 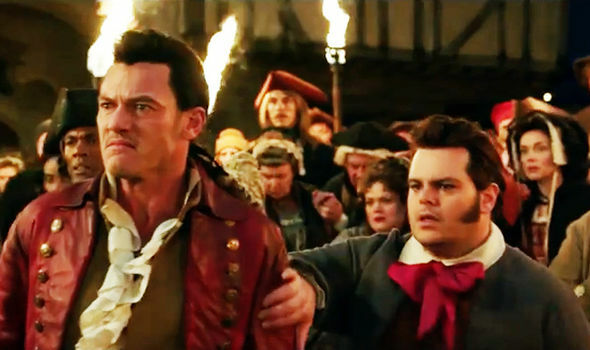 We must admit we were so disappointed when Disney decided to shelve the new Beauty and the Beast movie upon LPF’s decision to censor 4 minutes plus of the movie due to the “gay moment” issue. Nonetheless, we refused to bash anyone since we know how Disney works. Plus, we refused to make judgement until we watched the movie. So when CheeseBoy went to JB for a meeting, I decided to tag along so that we can sneak into Singapore to catch Beauty and the Beast movie. Yippie! The new Beauty and the Beast movie is not a carbon copy of the animated film. More scenes and songs added and more emotions were conveyed. From the new movie you will understand why Beast became such a spoiledbrat and why the helpers tolerated him. There was also a scene that explained the who was Belle’s mother and how they ended up in the small village. 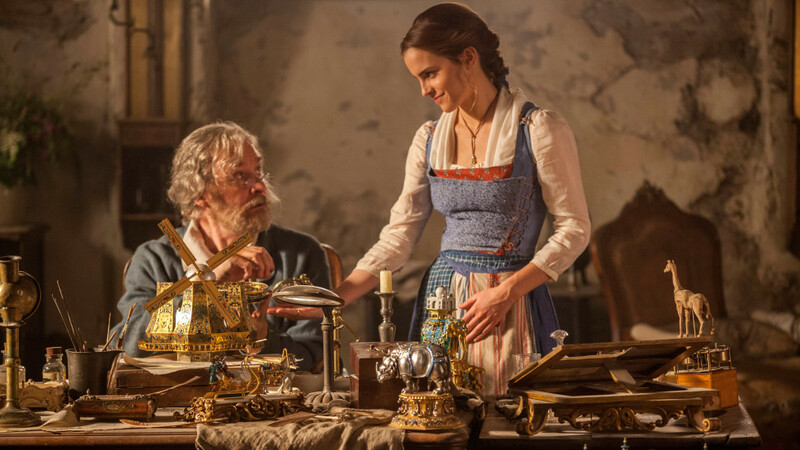 Belle and her father, Maurice, played by Kevin Klein. Maurice is the only person who understands Belle and they can speak about anything except for Belle’s mother. New scene added to the movie. 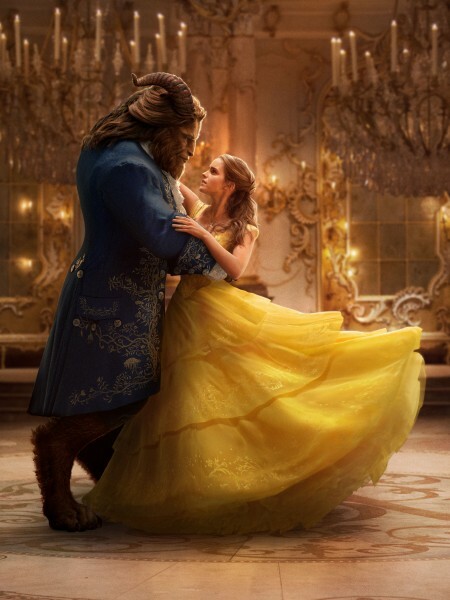 In this new film, you will see how the relationship between Beauty and Beast slowly grow. From hatred to friendship and eventually affection. You’ll also get to see Beast apologizing to Belle for calling her father a thief and Belle thanking Beast for saving her life. They both also discussed about their lives as outcasts and Beast even suggested to Belle for them to run away together. 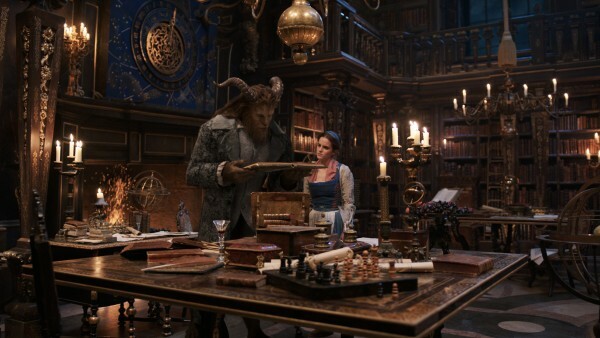 In this movie, the Enchantress also gifted Beast with a magical atlas that allows him to travel wherever his heart desires. He shared the book with Belle, and it took them to where Belle wanted to be the most. You can really feel the emotions from the movie. I guess that’s the advantage of live action as compared to animated. This is one scene they must not screw up and we are so glad that they didn’t. This scene is so magical. The lighting, the mood, the dress, are just mesmerizing. However, I still prefer Angela Lansbury’s rendition of Beauty and the Beast song, as compared to Emma Thompson’s. 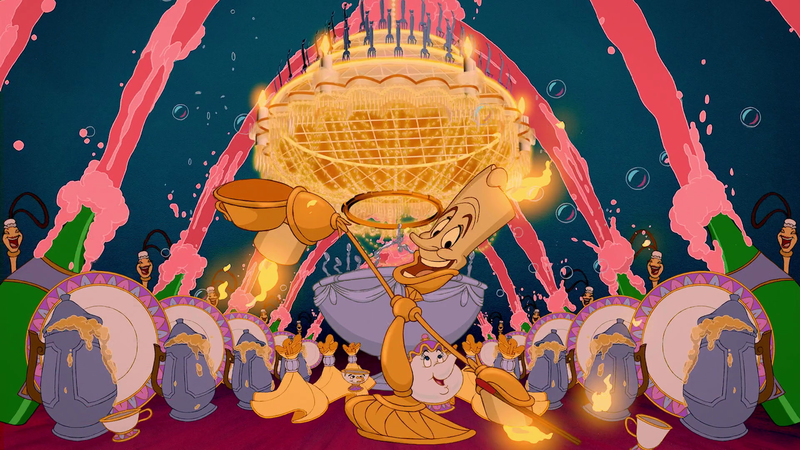 Be our guest, in our opinion is the second most significant song/scene in the animated movie. I remembered being blown away watching this scene as a teenager, but oh boy take my word for it the live action version is better! I love the explosion of colours and how lively the scene is. In this scene they also showed Aladdin’s castle, which made me wonder whether they gonna turn Aladdin into live action movie as well. However, I find the original film scene where the villagers attacking the castle more entertaining, as compared to the real live action one. I guess it’s because there are less household characters available in the new film. I must admit that I actually had tears watching the movie. (I didn’t cry as bad as the lady sitting next to me though.) Unlike the animated movie, Beast was not the only one dying when the last rose petal fell. The other helpers also died, by turning into lifeless household items. (“Rubbish”, as Ian McKellen’s Cogsworth would say) The scene was really sad peeps. Bring tissues. This movie was perfectly casted. 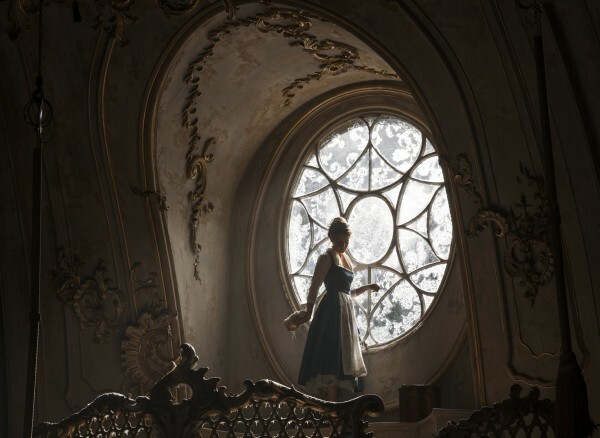 We have some serious doubt on Emma Watson as Belle. (She’s too famous to play Belle given her fame after playing Hermione Granger.) But she has proven us wrong. She sang very well too. 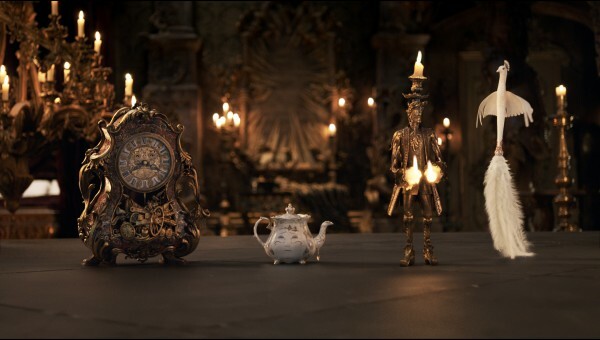 Sir Ian McKellen was under-utilized, I think there were lesser scenes of Cogsworth in this new movie as compared to the old one. 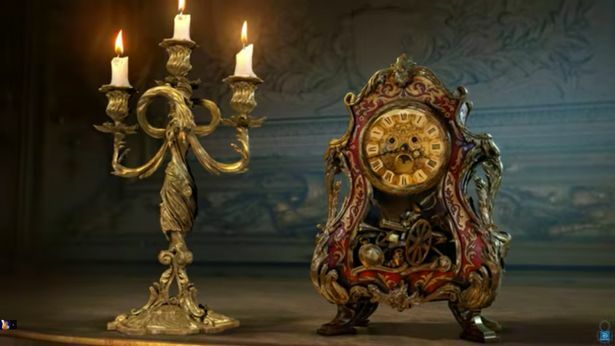 On the other hand, Lumiere is supposedly to speak English with a French accent. But Ewan McGregor sounded more Mexican than French. Hahaha! 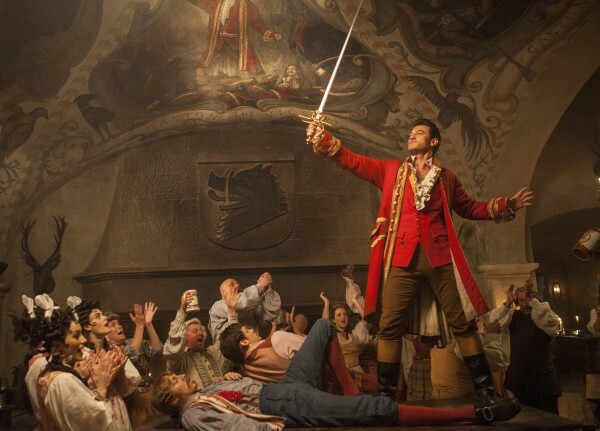 1) During the Gaston Song – LeFou showed a bite mark on his tummy. It’s not a love bite peeps. If you remember even from the animated version, Gaston likes to bite people to show how strong he is. Show off! 3) At the end of the movie, there is scene where LeFou danced with another male. That scene is just split seconds and can barely noticeable. It can easily be removed without giving any effect to the storyline. Enough of the “gay moment” discussion. We are glad that LPF and Disney decided to have a truce and Malaysians will be able to watch Beauty and the Beast this coming Thursday. Give Beauty and the Beast a chance peeps. Let’s watch it and then judge. There was so much work done to complete the movie. It’s a wonderful movie, simply magical. Verdict? We give Beauty and the Beast 4 stars!